Pop star Lady Gaga has her sights set on a trip to space aboard Virgin Galactic's SpaceShipTwo. 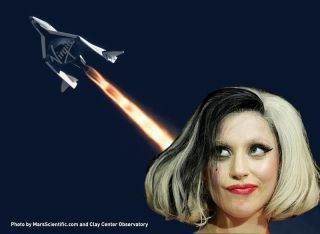 Lady Gaga is planning to fly to space. The famed 27-year-old pop singer is scheduled to blast off on Virgin Galactic's SpaceShipTwo in early 2015, according to press reports. Gaga will reportedly sing one song during her trip into suborbital space. "She has to do a month of vocal training because of the atmosphere," said a source speaking with Us Weekly. The source also told the publication that Gaga's entourage would accompany her on the space flight. Us Weekly also reports that Gaga will sing her song from space as part of Zero G Colony — a three-day festival at Spaceport America in New Mexico. This announcement coincidentally follows the release of Gaga's new space-themed song called "Venus." The song lyrics take the listener on a techno trip through the solar system, including a few references to aliens. "Venus" is a track off Gaga's new record, "ARTPOP," set for release on Nov. 11. Gaga joins the ranks of other celebrities with tickets to ride into space with Virgin Galactic. Justin Beiber, Leonardo DiCaprio and Ashton Kutcher have all signed up for seats. Tickets reserving a spot on SpaceShipTwo cost $250,000 and more than 600 people have already signed up. Another singer might be flying to space the same year as Gaga. Sarah Brightman — who is best known for starring in the original Broadway cast of the "Phantom of the Opera" — is planning on taking a 10-day trip to the International Space Station in 2015. Brightman is thought to be paying upwards of $35 million for the experience, which includes blasting into orbit atop a Russian Soyuz rocket. Brightman also has a ticket to fly aboard SpaceShipTwo. Canadian astronaut Chris Hadfield composed the first original song in space during his stint aboard the International Space Station. He recorded "Jewel in the Night," a song honoring the 2012 Christmas holiday, on Dec. 23, days after he launched to orbit.